Let me start this off with a little blogger disclaimer: this pad was given to me free of charge by the fine people over at Rhodia. Huge thanks to Karen at Exaclair (the US distributor of Rhodia) for the paper goods and Stephanie over at Rhodia Drive for sending me in the right direction. Both of them were very nice and enthusiastic, and I appreciate them taking the time out of their day to send a new blogger some stuff to review. Even though the pad was provided for this review, I still stand by everything I have said in my review 100%. 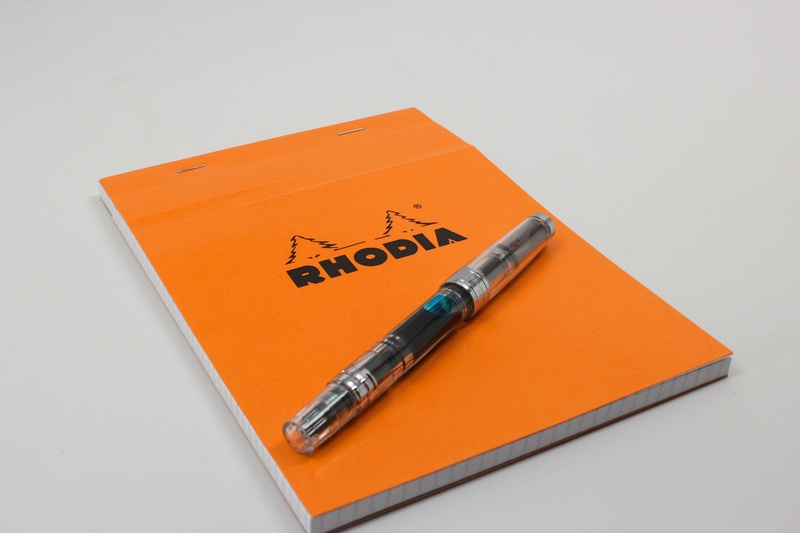 I have been, and will continue to be a Rhodia user, it’s some of the best stuff out there. 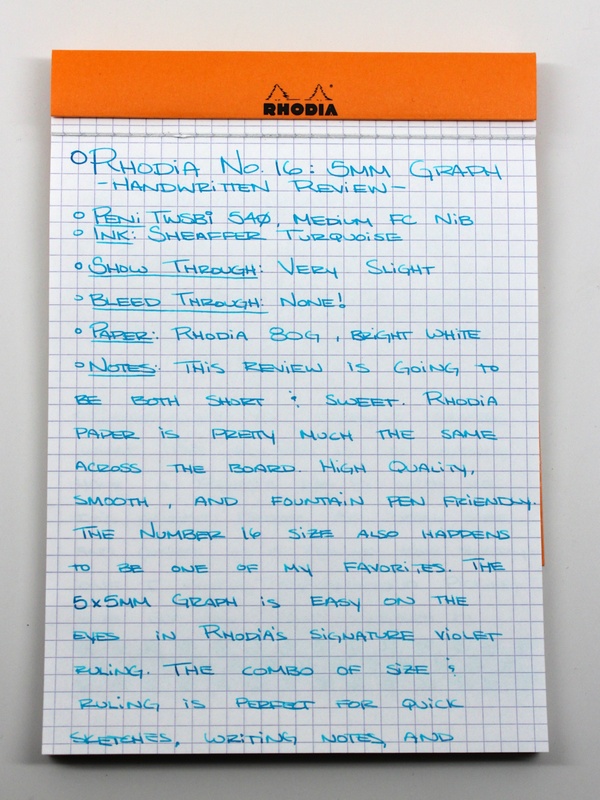 Notes: Rhodia paper is extremely fountain pen friendly. It’s very similar to Clairefontaine paper because they’re both made at the same mill. The only real difference is that the Rhodia paper is 10g lighter. It’s really hard to tell the difference between the two, even when side by side. The bleed through is practically non-existant, even with several passes of the nib. This is my third pad in the No.16 size, which I have come to prefer. 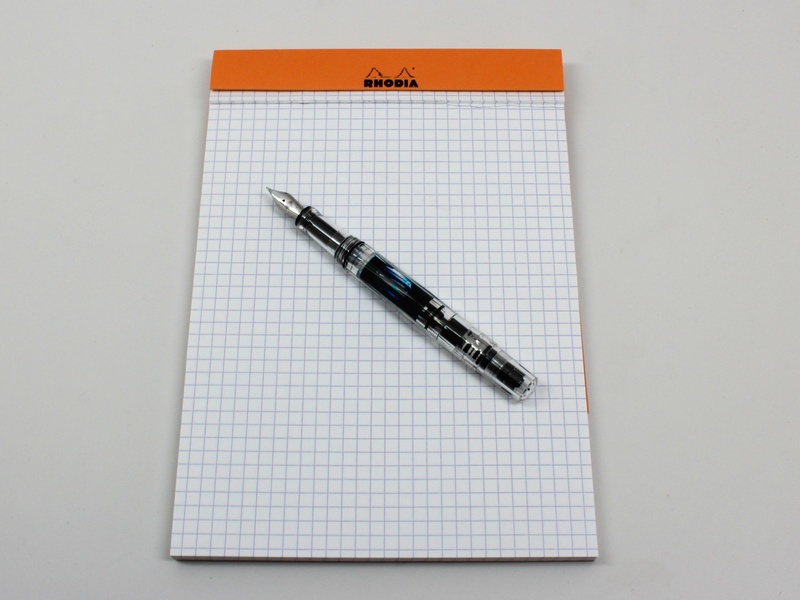 This was my first graph pad though, and I quite like it. I like the violet ruling that Rhodia uses across most of their line, it’s easy on the eyes yet it stands out a bit. It’s a nice departure from blue or green ruling that I’m accustomed to on graph paper. Make sure to scroll all the way down to the gallery, I went a little picture crazy! 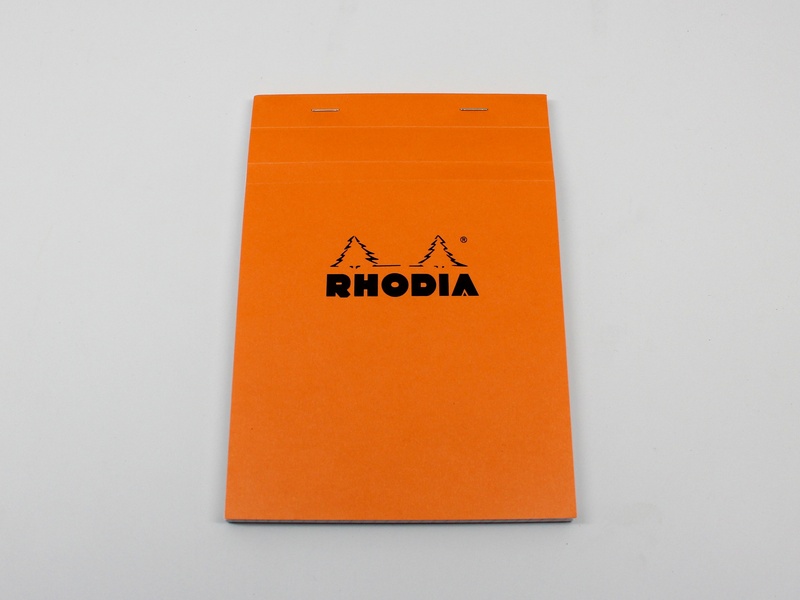 The signature Rhodia orange. The pen shown is a TWSBI Diamond 540. The No. 16 is an idea size for throwing in a bag and not taking up too much room. It’s a bit big to be pocketed, but I really like the size. 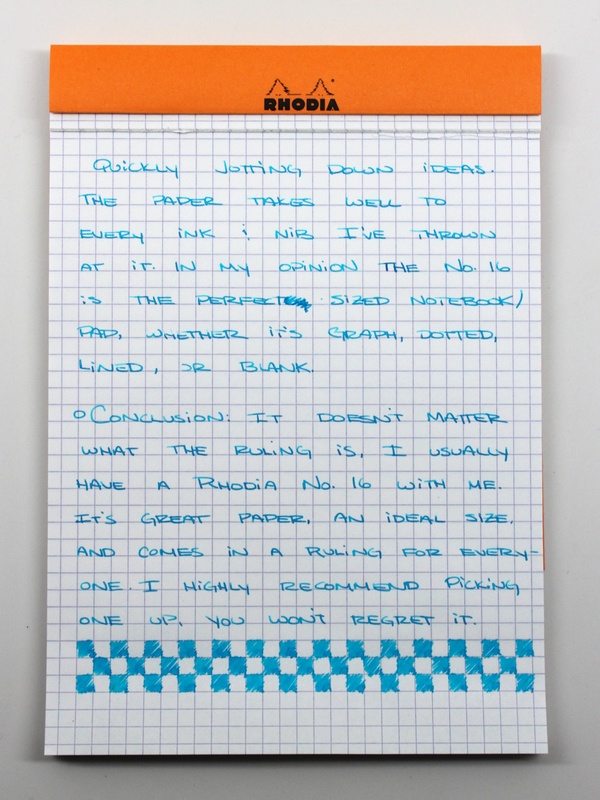 Rhodia’s paper is a nice and bright white that’s perfect for showing off shading inks. 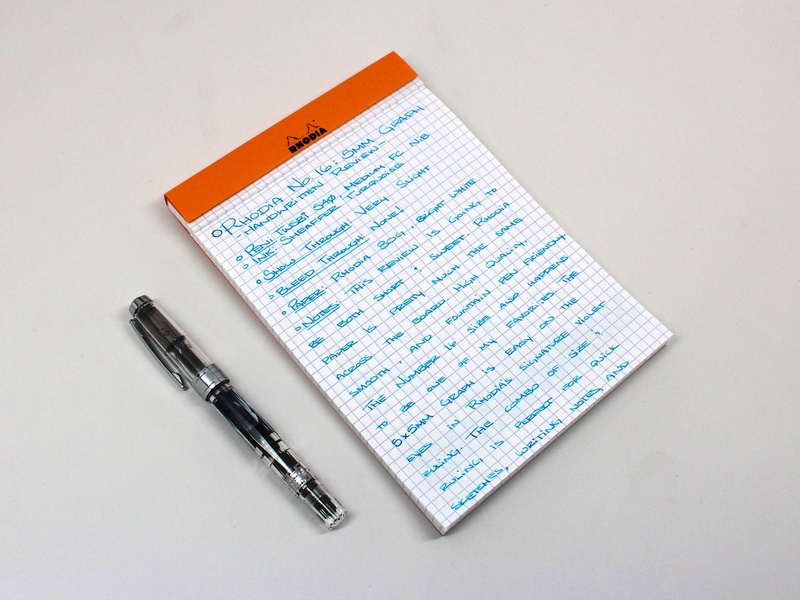 It’s doing a good job here at showing off Sheaffer’s Turquoise. Once more for size. The Number 16 isn’t too big or too small, it’s just right. 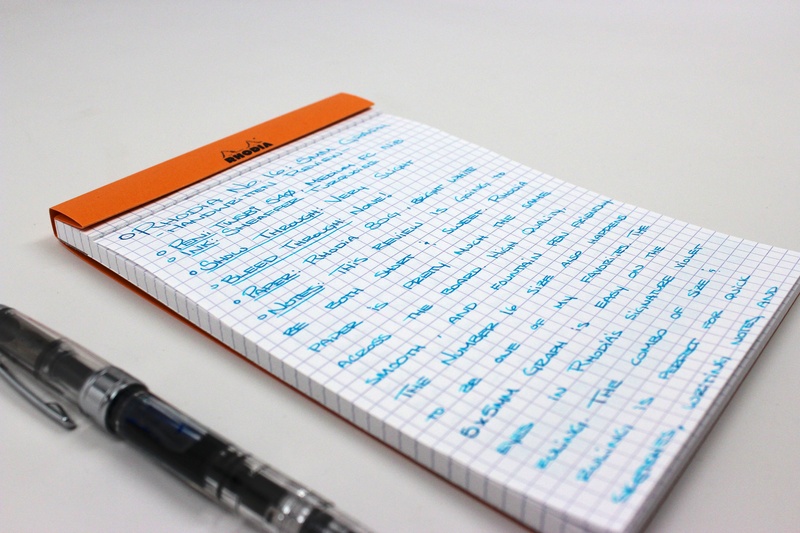 Signature Rhodia Orange. There’s no chance of this thing getting lost in a bag or on a desk. The pad is also available in black for the more subtle people out there. I’ve just ordered the No. 16 (lined) with the cover. Also the 8 great for grocery lists and the No. 12, just the right size for pocket or briefcase. Love Rhodia, definitely my favorite by far. Have used with Parker quink ink, J. Herbin, Lamy and Mont Blanc, no feathering or bleed through. Great for us fountain pen users. Nice! The #16 is an ideal size for pretty much everything. I have several in different bindings and rulings, they’re all over my desk. Just refinished a great antique desk with lots of pugeon holes, looks great and can’t wait to get my stuff on it. It’s only fitting that I screw up an English language phrase with a French word, while reviewing a French company’s notebook.